Spam is a mega problem for the online world and one that doesn’t show any signs of declining any time soon. Unfortunately, our websites are huge targets for spammers, who will exploit them by any means possible to spread their spam. If you have a WordPress website, there are a few key areas that you may wish to ensure are protected. When you first install WordPress, it comes with a plugin pre-installed called Akismet. While Akismet is undeniably excellent (and if it can fit into your budget, we’d totally recommend it), it does come with a subscription fee. 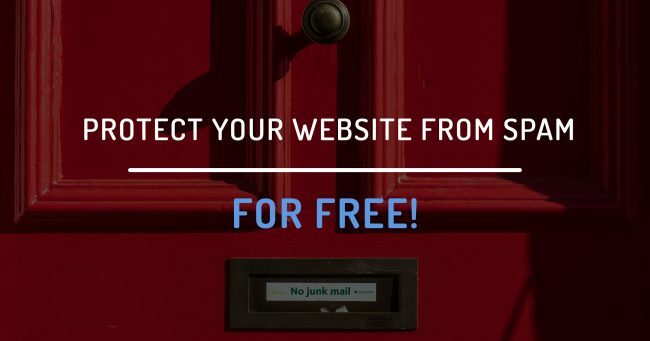 If you want to save money, or just have too many websites to justify the cost of multiple licences, there are many options for tackling spam for free. What will you need to protect these areas? We’ve listed contact form 7 because it is one of the most popular contact form plugins available, and also comes with the built-in ability to protect the forms using Google reCaptcha. We’ve then opted for Google Captcha (reCAPTCHA) by BestWebSoft to cover everything else (registration forms, comment forms and password reset forms). However, in saying the above, you may already be using a different contact form solution, in which case you may not wish to switch to a different plugin. In this case, we’d recommend checking what spam options your current solution offers or reaching out to the developers to see how you can install spam protection. Got the plugins! Now what? If you’ve got the two plugins recommended above, it’s now time to activate their respective spam protection features. Once you’ve signed up and generated your API key, be sure to note down both the “Site Key” and “Secret Key” somewhere, then head back over to your website. First up, let’s get reCaptcha installed on Contact Form 7. Hover your mouse of “Contact” in the left-hand menu after activating the plugin, then click on “Integration”. Here, you will then be able to paste in your site key and secret key. Voila! Your contact forms are now protected. As for Google Captcha (reCAPTCHA) by BestWebSoft, hover your mouse over “Google Captcha” in the left-hand menu, then click “Settings”. Once again, paste in your site key and secret key, then just choose what you would like to enable the captcha for. We’d recommend selecting registration form, reset password form and comments form. That’s it! You’re now protected from spam on your entire website without having to spend a cent.